JetSetting Fools – One Life. One World. Amazing surprise for a cruise which started operating only two years ago. Captain looks like a very experienced man as he handles the boat with extremely confidence. According to our guide he has more than 20 years of experience on the Mekong River. His wife cooking is marvelous and helps him with the boat whenever needed. Mr. Choy, our guide, was always very attentions and speaks very good English. We do recommend a two days cruise starting from Houay Xai to Luang Prabang with the night stop at Pak Beng. We had a wonderful experience with the Mekong Smile Cruise, right from the booking online, our hotel pick up in Chiang Rai all the way to Luang Prabung. We were very lucky to be the only people on the boat. Our guide Ka was informative and spoke good English. The family who run the boat were lovely and the food was great. All in all a very good experience. 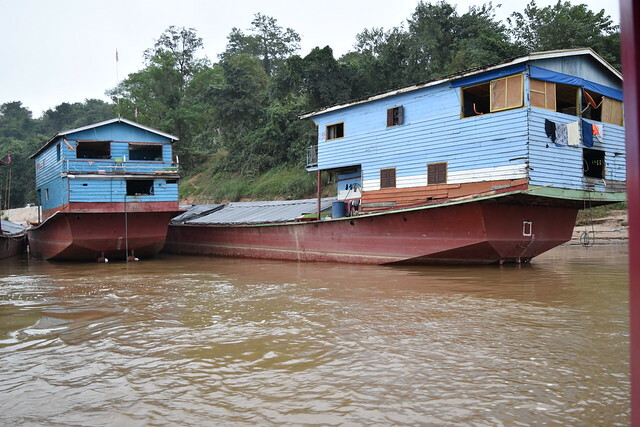 When I planned my Laos trip, I looked for a luxury boat tour on the Mekong. Unfortunately some of the provider like Luang Say or Shompoo were not very responsive (very slow response time to email, not helpful information, no flexibility etc. ), therefore I checked for an alternative, this is how I found Mekong Smile Cruise, and I am happy to have found them as it was a great experience! When I contacted the company, the owner was very responsive, he immediately replied to my emails, he was very helpful and flexible. I booked a private cruise and the rate asked was very reasonable. All was well organized. All people were ahead of time which was very much appreciated. The transfer from Chiang Rai to the boat was very nice and comfortable, with a nice and friendly driver who was fluent in English. He helped us up to the Thai border and explained how to get to the Laos border where the guide would pick us up. There the visa form was already prepared and I only needed to sign, really great service. The guide Kae was very nice, he did his best to accommodate us during the whole trip. The captain and his family were nice. The boat was large (usually the offer the trip up to 30 people). Relatively comfortable, there are also some day beds where you can relax. The food was very good on both days. Please note the boat is simple and not luxurious and the bath rooms are very basic, so be prepared, however it was really well done therefore the luxury was not really needed. The trip is really fantastic, the scenery is so beautiful!! And due to low season there were almost no other boats, really nice, beside of the trip where you always see great scenery, there are several short trips to some villages and caves, very interesting. I booked the hotel in Pakbeng where you stay overnight, on my own as I wanted to be sure to have the best hotel available (see related review). Overall a great experience, one of the highlights of my Laos trip! I can recommend this cruise, as the owner manages to organize it well. From hotel pick-up in Chiang Rai till hotel drop-off in Luang Prabang everything was as promised. Mekong Smile Cruise helps you pass Thai and Lao immigration, transport to the boat and then 2 days of relaxation with a magnificent scenery. Our guide was very good, the same goes for the captain and his wife (who made us excellent lunch). Our sun of four had the time of his life. Also the night in Pakbeng was very nice (Mekong Riverside Lodge). This will surely be one of the highlights of our trip through Laos. The 2 day cruise upstream from Luang Prabang to Huay Xai was the highlight of our trip to Laos and should not be missed by anybody travelling in this area. Mekong Smile were excellent to deal with, promptly replying to our email enquiry and confirming a boat would be running once we confirmed the date we wanted leave Luang Prabang. Payment was easy using PayPal and our guide contacted us at the hotel the day before to confirm our pickup time and check to see if we had and special diet requirements. Pickup was on time and when we arrived at the boat, found out that we were the only guests as it was low season and less people travel upstream than down. Our English speaking guide was full of knowledge and answered all our questions of life on the Mekong. The Captain and his crew handled the boat very proficiently in the sometimes fast flowing current and as others have commented, the food cooked by his wife was excellent, up with the best we ate. I would strongly recommend Mekong Smile to anyone looking to do the 2 day cruise on the Mekong. My family of four (including two teens) made the trip upriver from Luang Prabang to Huay Xai during the end of June. We were on the boat with two other passengers, Kat (our guide) and the captain and his family. We had ample room to spread out, play games and play with the captain’s boys! Food was good and ride was comfy. In fact, it was even a little chilly during the trip. Take board games, cards or books to pass the time. We booked our own accommodations at Sanctuary Lodge Pakbeng and were only people in entire resort…a tad spooky, but nice. Had dinner with Kat in town (can’t remember name of place) and it was delicious local food. Highly recommend and I wouldn’t hesitate to travel again with Mekong Smile! My recent 2-day cruise from Huay Xai, Laos to Luang Prabang, Laos with Mekong Smile was one of my best experiences on a 5 week Southeast Asia tour. The company arranged my ride from Chiang Rai, Thailand to the cruise departure point in Chiang Kong, my bus fare for the trip over the bridge into Laos, and arranged to have a guide meet me on the Laos side of the river to help me with the visa process, and then the shuttle van to the boat dock where we boarded the boat on the river. The guide, Kae, was great fun. His humor and energy were contagious. 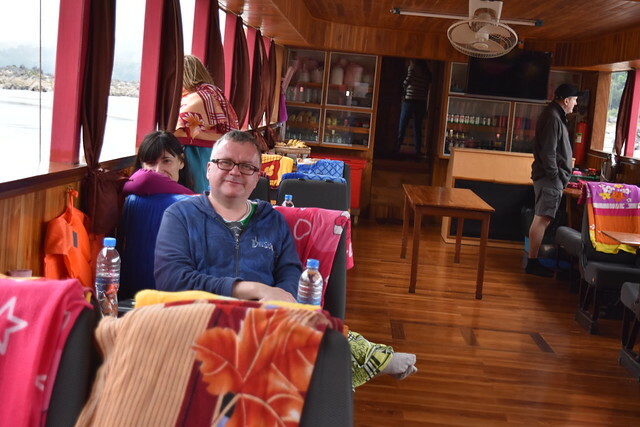 The boat itself was huge, beautiful and very comfortable, with places to lay down and snooze and lovely teak booths to sit and write, munch on fresh fruits and coffee, or just get hypnotized by the flow of the river. There were only 2 other passengers on my cruise, so we got to know one another pretty well over our 2 days together. The boat stopped each day at Lao hill villages so we could stretch our legs and get a glimpse of the lives of Lao villagers along the Mekong. 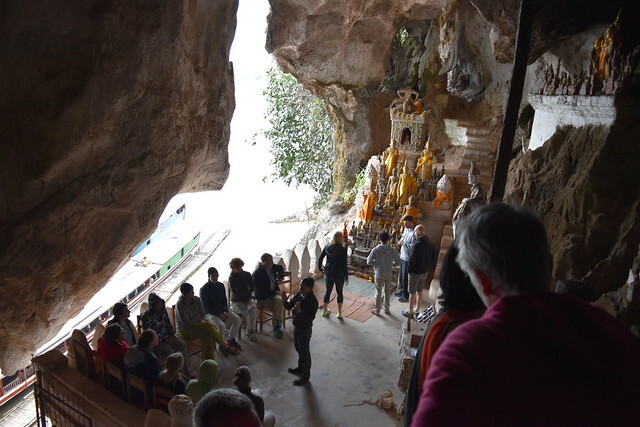 We also stopped to see the Pak Ou caves which was a nice excursion. The Riverview Hotel I was booked into at Pak Beng – the midpoint on the cruise was lovely, but my room was not air-conditioned. There was a strong ceiling fan, and good mosquito netting around the bed, and I slept fine. However, I understand the other two people from my cruise stayed at a different hotel which was not situated on the river, but they did have air-conditioning. Our experience was enhanced by the fact that our guide, Kae, had his birthday celebration while we were in Pak Beng. We had a super fun celebration with Kae and his friends from Pak Beng. It was a great introduction to Lao warmth and hospitality. Finally, special thanks to the Captain of the boat and his wife. The Captain made navigating the complex currents and shoals of the Mekong look simple. And the lunches prepared by the Captain’s wife for us in the boat’s onboard kitchen were sensational. Great, local, authentic Lao dishes. My wife and I were the only passengers. We went from LP to Thailand. Everything about it was great. We agree with others who have commented the food was wonderful. We did get our own hotel in Pak Bang. Everyone involved was as nice as can be. Highly recommended! Unfortunately I was the ONLY passenger on this cruise as another couple didn’t show, yet the staff and especially the tour guide put every effort in to make my time enjoyable. The guide was very knowledgeable and spoke great English. The boat was clean and the food was great. I don’t know why someone would pay twice as much for a luxury cruise, this was more then adequate and the staff were fantastic. My wife and I were looking for a good alternative to riding the local bus from Huay Xai to Luang Prabang after doing the Gibbon Experience. We had heard the local boat gets full going downriver and some cruise companies charge $300-$400 USD per person for the two day cruise downriver. Thus we found Mekong Smile to be a great mid-range option. Going to the booking office in Huay Xai was easy as they are right on the main road and pricing was up front with a good explanation of the cruise itinerary. We booked our trip about 5 days in advance and had no problem. Why anyone expects a tour company to have last minute availability given the logistics of the tour is beyond me, tour guide, food for meals, boat captain and cooks, etc. You can also email them to make your booking online and pay via PayPal. It is all quite easy and we had no worries about using Mekong Smile. In fact my wife has a gluten allergy and cannot have soy sauce or wheat flour. Our guide spoke excellent English and made sure the cook made her food without any gluten. Every meal was delivered directly to her so there was no confusion and it was delicious. Everyone else had the buffet food which was plentiful and also delicious. Each meal was different so there was plenty of variety and all the passengers were very satisfied. Not much else to say that the other reviews don’t already say. There were only 11 ppl on our boat so plenty of room to spread out and relax. In fact one other couple we met at the Gibbon Experience was also on our boat and they also loved it. The hotel accommodations in Pak Beng were nice. The breakfast meal was across the street at a local restaurant and was excellent. I would recommend dinner there as well because the dinner place our guide took us to be so-so. They did give us a free taste of Lao Lao, or the local whiskey. But the food was just okay so eat at the restaurant across the street for better food. I would definitely take Mekong Smile between Luang Prabang and Hauy Xai again! From the moment we were collected by Kae and Pheng at the border into Laos from Thailand I knew we were in good hands. Formalities over, we collected a few people in our minivan along the way to our beautiful boat before boarding for the two day cruise from Huay Xai downstream to Luang Prabang with a one night stop over at Pak Beng. Our guide aboard was Kae and he had us all laughing before too long with his little jibes and jokes. We taunted him right back with his snappy dressing and his fun sense of humour. Incredibly luckily for us, we were only eight passengers for the trip, so we had the whole boat to stretch out on or to read or sleep. Indeed we were “VIP’s”. Our captain admirably navigated his way through some tight spots and his lovely wife Nok freshly prepared the most delicious food we ate anywhere in Laos. No kidding! The scenery along the way is spectacular with a photo opportunity at every corner. Our boat was well equipped with a large ice box and it was a treat to enjoy a cold beer or a soft drink with lunch. Bottled water is free. It wasn’t too long before the eight passengers became a group of friends we affectionately named “The Falangang”. (Falang = foreigner) who have kept in touch and have since shared other travel adventures. We were two Aussies, three Germans, two Welsh and a Finnish man. Tip: If you have room in your luggage you could take some second hand clothing or small items for the incredibly poor children of the hill tribe village we visited on our first day. It would probably be the second day if you are boating upstream from Luang Prabang. Be prepared to buy some little hand stitched bracelets from the kids as they gather around you and want to show you their wares. Obviously don’t just give money because that is setting a precedent that ruins the experience of meeting people who live in a different way. We handed out clothes, balls and pencils which the children loved. Our overnight stay at the Riverside Lodge in Pak Beng was delightful. We stayed in our own little Laotian hut with a verandah overlooking the Mekong River. Very rustic and quaint, still with bathroom luxuries though. The electricity did go out for most of the night but we didn’t care, sleeping under our mosquito net in our bamboo thatched cottage. On the second day we visited a mixed tribe village, Lao, Khmou and Hmong. This was a lovely experience as we watched village women at work on their looms creating beautiful handicrafts with incredibly intricate designs. You are encouraged to buy their items which are truly works of art, very inexpensive and the genuine article, not some mass produced rubbish you might find in a city street market. It was very hard to choose between so much varieties of designs and colour. Again clothing, pencils and balls were welcomed by the children. Lilies or other small food items would work too. Truly this is one of the great travel journeys in the world and will leave you with a lifetime of fond memories. Thank you Pheng and Kae. We had a 2-day long cruise in Mekong, from Huay Xai to Luang Prabang. Everything went fine. A person was sent from the company to take us to the border between Thailand and Laos (from Chiang Khong). Another two were waiting us after crossing the friendship bridge by a bus. They assisted us to get the visa and cross the border. We departed from the port of Huay Xai in Laos, with another couple of Australians. Practically, the boat was empty, probably because of low season. We had a great experience. Nice trip, watching daily life of the people on the banks of Mekong. The captain was very experienced, which is necessary, since Mekong is a difficult river for sailing. We stopped in two villages and saw local people, which has been one of the highlights of our trip in Laos and also stopped in the Pak Ou caves. We had plenty of nice food and free coffee, tea, water and fruits. Also, our guide was very helpful. Cons: There is only one negative point in this trip. Our hotel in Pakbeng was mediocre. I understand that most hotels in this village are like this, but I believe that one can find alone a better hotel, so I would choose the option of booking the cruise without hotel. Also, the worst of all, we had to carry our baggage for several hundred meters uphill, from the port of Pakbeng to the hotel. We saw from other boats that several vans had been sent for this transfer, since a paved road exists. I believe that at the price we payed, the company should have arranged a van for this transfer. Everything else got fine and this was a nice 2-day cruise in Mekong, from Huay Xai to Luang Prabang, which proved to be a nice experience! The Mekong Smile two days river cruise was great experience, comfortable and relax on the boat, the tourist guide very helpful and nice, talked a lot of about Laos, let me know deeply about the country. And different local village visiting was very valuable. The trip down the Mekong River from North to South, the review was amazing great and beautiful. Lunch was delicious, and one day we can join to make the salad, very funny. The Mekong Smile two day river cruise from Luang Prabang to Huay Xai was fantastic and I would definitely recommend it. I happened to be the only one who booked this particular journey and I was shocked that they would operate it given it was just me. That level of commitment alone impressed me. The guide and boat crew were professional, accommodating and kind. The food made on board was authentic Laos food and so delicious. Having unlimited coffee, tea and water was an added bonus. The scenery was beautiful. The boat was super comfortable and clean. Try to snag one of the day beds, it’s so nice to take a nap on and watch the river go by. I would also recommend adding the Mekong Riverside Lodge to your package. It’s a beautiful place and I only wished I had more time to enjoy it. If you’re crossing the border to Thailand and are unsure about the process I suggest paying the extra $12 to have them assist you. So worth it! Mr. Khum, the guide is filled with tons of information, you can ask him anything! He really went above and beyond. He met with me the night before to chat about the trip and knowing I was traveling alone offered to dine with me the one night we stayed in Pekbang. So nice!!! The visits to the caves and local village needs improving as you feel a bit rushed but hopefully they’ll work on that. The two days flew by and a month later I still day dream about being on the river enjoying the peaceful beauty of the Mekong River. My husband and I have been travelling in Southeast Asia for the last couple of months. The trip we took down the Mekong River on the Mekong Smile cruise boat Pheng was definitely one of the highlights. First off, we appreciated that even though our boat wasn’t fully booked, they sent us out rather than trying to jam us on somebody else’s boat like some tour companies do. We had a lovely small group. Our guide, Somkhit, was pleasant and knowledgeable from the beginning, a really great guide! I must mention that the chef, Chanhsee, made us probably our best two meals in La Laos. These “lunches” were an outstanding affair with at least five dishes to choose from, everything wonderful, including delicious local soups. We were particularly taken with the lemongrass meatball dish and when we enquired found out it was a special dish that they used to make for royalty – DELICIOUS!! I could recommend this tour for the food alone, however the highlight is just floating down the river enjoying the beautiful, beautiful scenery on the banks of the Mekong. Our captain, Pheng, was an expert river man and if you didn’t have any boating experience, you might not realize what a difficult task going down a swift flowing river can be. He was such an expert that it was relaxing from start to finish. After two days of staring serenely at scenery (a couple stops and tours along the way to see local villages as well) I could only wish that I had a few more days to do the very same thing! Great trip, great value! Thank you Mekong Smile! I was expecting to be sipping drinks on a sun drenched sun deck, so finding myself completely wrapped in a large fluffy acrylic and gaudy coloured “Hello Kitty” blanket was not quite the picture I imagined when I booked a two day Mekong River Cruise trip to take us from Laos’ second city Luang Prabang to Huay Xai a town near the Thai Border and the closest place to our next destination. While the view was truly to die for and we loved the experience overall, I did not quite anticipate how the cold winds coming down from the Chinese plains would wash down into Laos and the Mekong in January, meaning that the air was pretty cold in the mornings even if we were just 20 degrees north of the equator. While the temperature warmed up into the afternoon that last minute decision to pack a thin but warm merino wool skin jumper and a hoodie served me well, but the choice of shorts and long linen trousers only ultimately proved to be an error. The Mekong River Cruise was made early in our trip and where we were still just a little tired and jet lagged after our long flight; I therefore thought a couple of fairly chill days would suit us well while we floated past the views from the river. As it turned out, the tour “felt” quite energetic (although we spent much of it parked on our bums) and it was a different kind of chill that lingers on in the memory. After speaking with the friendly Smile team by internet, we determined what we wanted. Our trip from Luang Prabang to Huay Xai incorporated a night sleep over in a village hotel on the way and we had a choice of booking a boat for just our party of 4 or for a cheaper cost mixing it up with others on board (which is what we chose). In the end no one else wanted to stay in a boat with me for 48 hours, but I didn’t take it personally as it transpired that most tourists arrived into Laos from Thailand and took the reverse trip onto Luang Prabang rather than out of the city. All the boats coming back up the river out of LP were pretty deserted (I think the most we saw on a single boat was about a dozen). Once arranged, we had to bite the bullet and pay a foreign business full cash up front via pay pal. It was a risk, but to be fair, the kind people from Smile kept in touch and also arranged for the tour guide to visit us at our hotel in Luang Prabang the evening before our trip just to give assurance that he would be there in the morning. Our trip for the two days, one night’s basic but clean accommodation and food on the boat came in at around £100 a person. I call that something of a bargain. Despite the chili mornings our trip was pretty amazing really. The boat was a long barge with seating for 100 people. There was our party of 4, our friendly guide Keo, and the boat owner, his wife and two teenage kids on board. It kind of felt a little deserted but after a while we quite got into having the place for ourselves, sitting on one side of the boat or another, front or back, or out in the open front in the afternoon sun. It was quite a trial wandering around picking up stray books, sunglasses, camera, sun screen, sun hats, drinks and packs of cards at the end of each day, and it felt like we had sat in each and every seat on that boat. Inside was nice and clean and I liked the wooden interior, and what looked like unscrewed coach seats, all covered with a blanket with a cartoon character on them. It would seem it is not unusual for fat tourists to feel the cold. While I loved the view from the unpaved windows there were occasions in the morning where I marveled at what a wonderful invention glass was. The Mekong river although wide at this point, still looked an interesting river to navigate with plenty of bends and scary rock formations in the middle. I enjoyed looking at the geology of the rock formations particularly as at one point one side of the river had entirely different rock formations to the other side. One of the quickest ways to get around this part of Laos is to take a speed boat between the two destinations which rather than taking two days does the whole trip in 8 hours. I have done the speed boat thing for an hour or two and that really was great fun but that time scale was quite enough. I think I would have left a long trail of vomit down the Mekong while complaining of back ache had I chosen that particular 8 hour option. Given the slightly tricky navigation I am told speed boat accidents are quite common; and it was telling that as they zipped past I spotted the drivers tended to wear crash helmets whereas the “invincible” tourists went alfresco. Our guide told us he used to take the speed boats all the time, but he then had to promise to his mother to stop using them as she got so frightened for his safety. It’s telling when the locals don’t use the service. Along the way, it was pretty much wall to wall mountains, forests and sandy river beaches. There were signs of life all the way along the river however, and we spotted locals panning for gold, punting between fishing rods, nets and baskets, growing peanuts on the light sandy soils of the beach, astride elephants and buffalos or there were kids just frolicking on the river in narrow local boats. There were just a couple of signs of things to come along the way, and the only town of note that we passed through in the entire two days was the place we slept at. We passed a Chinese sponsored bridge, where our guide told us that the Chinese builders pay local Laos people to work on the bridge and also promptly build a casino, a bar and brothel on site to get their money back. We also passed a couple of very large banana plantations; again apparently the land is leased to Chinese traders who dump huge amounts of pesticide on the land and get amazing crops for a year or two before the land becomes degraded, poisoned and unworkable. The produce end up for sale in Singapore (a word to the wise if you go to that city; ignore the bananas). I have to say that China didn’t get a positive word while we were in Laos, and after we have left I have heard about a number of killings of Chinese businessmen in Laos such are the tensions in the region. There were also a few pit-stops end-route. We stopped at a cave filled with statues of Buddha (who else? ), had our overnight village stop, and also stopped at a resettled village where we helped fund the local school. Our guide explained that the villagers were resettled opium croppers; the government had insisted they had to move and stop their opium production and they were enticed by the prospect of running water, electricity and schooling (paid for by the tourists). It was a nice neat but basic place with pigs and dogs trotting around, and the kids were happy to pose for a photo and giggle shyly at us. Our hotel for the night had very small rooms, was very basic but it was also clean and central. We could have left our heavy rucksacks on board the boat where they would have been safe, but we had a bit of rejigging of luggage to undertake. Keo our guide was very friendly and quickly picked up that we really didn’t need a running commentary of everything. He did have a good knack of really picking up on the things that caught our eye and then letting us know about that. We enjoyed his company, and he took us around the local market and told us that on a previous trip one of the guests had taken up his offer to eat one of the frogs that you could buy live in the market, and which the stall holder cooked for you while you waited. Given that our host was capable of rustling up food for 100 her meals were fantastic and cooked on board. There were plenty of veggie dishes, steamed fish and chicken, and absolutely plenty of it – we didn’t eat a fifth of the food placed in front of us (of course the crew ate with or just after us). Tea, coffee and water was readily available and the local tea was particularly nice to my taste; like a nice fresh mild green tea. We also bought a bottle of Beerlao each afternoon, but we appreciated that it would not be a grand plan to get completely slaughtered. Our alternative to a two day boat trip was a very long and bumpy taxi ride that probably wouldn’t have come in much cheaper than what we paid, or another flight (we already had 9 hops scheduled in just over two weeks, so another one hardly felt vital). I did look at flights through the second airline in the country, Laos Skyways, but their website didn’t allow me to book anything for the month in question and I lost confidence in them after three weeks of trying and where my emails to them got no response. I was never going to do the speed boat thing. In this context the thought of a relaxing boat-trip gently taking us on our way sounded like an excellent plan and it worked a dream. While I don’t particularly often choose organised tours, given it was just us on the boat and Keo was happy to read and doze rather than feel he needed to entertain us, it didn’t feel like we were being herded around and there was no laggard in the group. 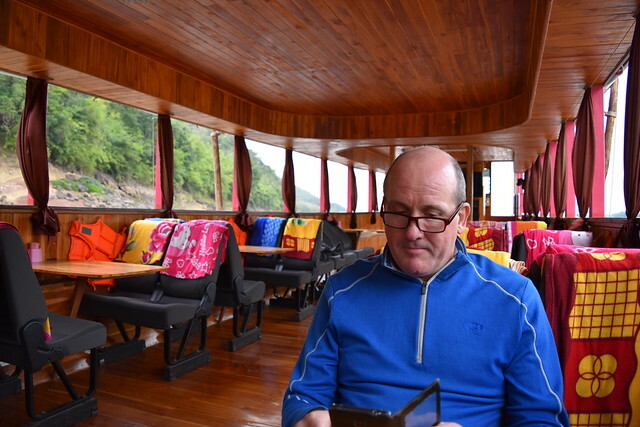 In terms of comfort, the boat was perfectly pleasant and looked the business with its wood interior, the crew were friendly and the food excellent, and the views along the Mekong were one of the highlights of our Laos trip. Our night stay was basic but comfortable and our trips off the boat were also worth doing. All in all there wasn’t really anything to dislike and if I had my time again this is a part of the trip that I’d certainly do again. Do not hesitate to book with Mekong Smile Cruise, it was fabulous from start to finish. We were picked up in Chiang Rai, Thailand and taken to the border crossing. Pheng was there to meet us and assist with the visa requirements on the Laos side. We were driving to our hotel in town and collected the next morning and taken to the boat, always at the time advised or slightly earlier. There was 15 of us on the cruise and we were all comfortable and could move around as we wished. There was always tea coffee and fresh fruit available and the lunches were amazing, so good!! The stops at the villages were really interesting, and the children appreciated the pens and paper we took for them, at the overnight stop we bought some more pens and a football for the stop on the second day, other people also purchased gifts for the children. We also stopped at Pac Ou caves just prior to arriving in Louang Prabang, they are not difficult to get to from the boat. Upon arrival at Louang Prabang there was a mini bus waiting to take us to our hotel. You have a guide all the way who explains things as we travelled. If you are worried that two days is too long, don’t worry no one on board got bored. One of the highlights of our tour so far. It’s a very good trip, i have done it with local boat and with this on, is worth every dollars to go on this boat, you have space and the guide we have was Amazing. Great experience compared to cheaper options. The Mekong Smile cruise was well organised and very relaxing. We were not packed in like sardines with only a small number of friendly people. The boat was comfortable with reclining seats, the food was taste and more than enough. Could even purchase a beer if you wanted to. Our guide was well spoken and informative. He looked after us extremely well. The scenery was amazing. The overnight say in Pakbeng was a real experience in itself. You have the choice to choose your own accommodation which is worth looking into. We arrived in Lang Prabang safely and feeling very rested and relaxed. We were very pleased we chose Mekong Smile. We planned to take the slow boat to Luang Prabang but decided to upgrade at the last minute. We wanted comfort, space, food and ease of travel. We were picked up at our hotel in Thailand, transported across the border to Laos. Once there we were picked up by our guide and taken to the boat. He spoke English and had wonderful stories about his experiences as well as others. We stopped at several villages. It was a highlight of our travels. The food was excellent. The total cost was $150 per person, well worth every cent. This was one of the highlights of our trip to SE Asia. The whole experience was amazing, everything was perfect from the boat, the food, the village visits, the overnight hotel even the weather was perfect, if a little cold first thing in the morning. A special thank you to our English speaking guide, the boat captain and his family. We were made to feel very welcome and all were most helpful. Only issue was alighting from the boat at Pak Beng. It was a steep climb up a sandy slope and maybe not easy for some people. I can only continue with the good reviews already posted so far. The whole cruise was very well organized: Starting from the pick-up in Chiang Rai, through the accommodation in Pakbeng up to the taxi service in Luang Prabang. Mr. Pheng and our guide Kae even helped us with all the formalities required to cross the Lao boarder before entering the boat! So if you are looking for a good alternative to the slow boats, Mekong Smile Cruise is definitely a good choice. The boat is very nice with enough space to enjoy the sun and the Lao beer. Included in the trip are also three stops (we visited two villages and the Pak Ou caves). Our guide Kae was always very concerned about our well-being and provided us with lots interesting information. All in all it was a really wonderful and relaxing trip, I would highly recommend! From our first email require from the final drop at our hotel, Mekong Smile was fabulous! The value for the money is great. The boat was comfortable, not crowded at all. The tours along the way were nice excursions. A tip for the next group — bring along pens and notebooks to give to the village children. The tour groups help support their schools. Our guide Mr. Ca was knowledgeable and super friendly! The food was great and the beers were cold. Accommodation in Pak Beng was fine; they gave us a few options and we booked in at Mon Sa Van. They even called vans to take us directly to our hotels in Luang Prabang! I would definitely recommend this over the public boat or the speed boat. The value is great!! Fast forward to 2016 and the parameters associated with boats filled with travelers remain unchanged. The public slow boats coming downstream were packed with all 100 (+/-) seats occupied. Those going upstream, well – not so. The Mekong Smile slow boat pilot came from a village between Luang Prabang and Pakbeng. His wife prepared a wonderful luncheon on both days and their son assisted in every way he could. My wife and I were traveling with a friend and the three of us had the 36 passenger boat and the guide, Kit to ourselves. Kit was raised in a village located on one of the Mekong tributaries near Luang Prabang. His family grew hillside rice. He learned his English during 6 years in a monastery and had experience with tours in Laos as well as the surrounding countries of SE Asia before going to work for Pheng at Mekong Smile tours. Kit had a great deal of knowledge about the ways of the people and the flora and fauna of the region. The boat stopped at the Pak Ou caves and two villages on the way. Kit explained the differing tribal influences in each village as well as the history of the caves. With all logistical affairs handled by Mekong Smile (transportation to the slow boat pier 7km north of Luang Prabang, accommodation in Pakbeng and midday meals), we were only left to find dinner in Pakbeng. The breakfast was “take away” from the Pakbeng guest house. Pheng can arrange guest house accommodation in Huay Xai and transportation to/from Chiang Rai or Chiang Mai, including border crossing logistics. In short – the Mekong Smile Cruise was absolutely first class! We enjoyed crushing down the Mekong. It was in every way relaxing and enjoyable all the way from pick up to drop off. The stops on the way made it very interesting. We didn’t want a crowded public slow boat and we didn’t want a dangerous and uncomfortable speedboat. We also didn’t want to pay the blue for a high end cruise. That made this choice perfect for us! Highly recommend. Every aspect of this river boat cruise was wonderful. All details and logistics are pre-planned so you need only to relax and enjoy the scenery. You will certainly find cheaper means of getting between the countries but if you want a non-crowded boat with excellent tour guides and the ability to really enjoy your experience, opt for a trip with Mekong Smile Cruise. They assist with obtaining visas, offer private drivers between Chiang Rai and Huay Xai (included in the cost), and ensure you arrive to your hotel in Luang Prabang. Highly recommended Tour Company! The unusual cold spell in Lao end of January beginning of February was paramount in changing our travel dates and it became necessary to carry on our journey on Chinese New Year. Not our preferred choice but we got on to the internet and Mekong Smile cruises offered a slow boat trip von Luang Prabang to Huay Xai. We booked and then quite a few things did not proceed as initially foreseen; payment via internet was not possible, the Hotel in Pak Beng was fully booked, and communication via the net was cumbersome. We initially expected the worst, but then everything worked like a charm. We were picked up at our Guesthouse in Luang Prabang spot on time, and amazingly we were the only guests on the boat. We assume this is due to the fact that: a.) Most travelers are going downstream, b.) Chinese New Year and c.) The boats have to go upstream to Huay Xai to pick up the next load. But who is to complain, we had the guide all to ourselves, plenty of space to feel really comfortable, a competent skipper and his wife as a very attentive cook. To report about the Mekong, the people living next on it and the wonderful scenery would take much more time and space, but should be done by every serious traveler. There is no doubt that not all Slow Boat Trips are like this but it was an experience and we can recommend Mekong Smile Cruises anytime. We booked a trip down the Mekong River through Mekong Smile to facilitate our journey from Thailand into Laos. We were picked up from our accommodations in Chiang Rai, Thailand and driven to the border. Once in Laos, we were greeted by another representative from Mekong Smile, who guided us through the visa process. The cruise itself was relaxing. There were only five guests, including myself, on the boat, which gave us ample room to move about. This was a stark contrast to some of the other slow boats we saw, which were packed. Kit, our tour guide, was very friendly and knowledgeable about our stops. Additionally, the food served on the boat (lunch on both days) was some of the best Lao food we had. Tip : sunhat, sunscreen, water, warm clothes cold wind on river, include lunch to be provided by boat owner. We had a great cruise – just as described. The people were very nice, food was excellent, excursions as promised and the weather was great. I highly recommend this tour. It exceeded all of my expectations. This cruise could not have been better. From the moment I was picked up, until I was dropped off at my guesthouse after the cruise, I could not have asked for anything better. The boat was beautiful, the guide was knowledgeable and fun, and always available to answer any questions. The food was excellent, and non – stop. The Captain obviously knew his job very well – this river requires good navigational skills. The stops were informative, and well planned. The scenery was above and beyond what I expected. Everyone on our cruise considered it a perfect 2 days. A fantastic trip on a clean nice boat, with good food and people that cared for you every step. Drivers were on time, everyone was helpful, the scenery was perfect, something we would really recommend. Good value! Despite being a relatively new company Mekong Smile ticked all the boxes. From the moment we booked they were helpful, friendly (there was no hard sell which was nice) and well organised. The boat, on the first day in particular, was charming! It was clean, comfortable and had great food. A perfect way to spend a couple of days drifting down the Mekong. I would whole heartily recommend this company to anyone thinking of booking. My husband and I are both well-traveled, and this was unequivocally one of the best experiences for both of us. They picked us up from our hotel the first morning right on time and the adventure began. Because we traveled up the Mekong from Luang Prabang to Huay Xai our boat was empty except for us – apparently most travelers head down the river, so this could be a tip for anyone wanting a less full boat. Our guide, Kae, was excellent. He was very knowledgeable about the river, the people living on the river and the Laos culture. The food was also amazing, and our guide was able to tell us about the ingredients in every dish and how they were prepared – definitely going to try a few of the recipes myself at home, although I don’t expect I’ll be able to pull them off with such perfection as our on-board cook, as she’s undoubtedly been preparing these dishes her whole life. I highly recommend this tour to anyone looking for beautiful scenery, in-depth knowledge about the Lao culture and landscape and overall a very, very special experience. I only wish I could give it more than 5 stars! My wife and I just completed the slow boat trip down the Mekong. Smile cruise were excellent right from the start. They were responsive to emails in a timely manner, and delivered as promised. Pick up at our hotel was prompt and from that point on they did a great job of looking after us. Our guide San was knowledgeable and spoke pretty good English. The tours provided with the package were good, appropriate in length and interesting. Shuttle to our hotel at the end was comfortable and well organized. I would definitely do it again with them. We decided only the day before departure that we would take a Mekong Smile cruise from Luang Prabang to the Friendship Bridge on the Thai border. We were recommended the cruise by some fellow travelers, who had travelled into Laos by this route. We were fortunate to be the only people on board, and had the most relaxing and enjoyable trip. Our guide, Pheng, was courteous, helpful and attentive. The couple who drove the boat and prepared the food were delightful. The food was tasty and generous, and our overnight stay on Pakbeng was fine. Overall, our two day trip was a very restful and enjoyable experience. Markymarkpaisley said “Totally brilliant trip!”Reviewed November 12, 2015 via mobileWe had a great time with Mekong Smile Cruise. Great email communication, the boat guide was brilliant, boat crew were great and the food was delicious too! The trips were really good on the river too. A nice boat and such lovely polite, gentle and humorous people too! This is my first trip to Laos and I will be back! We had an amazing time on our Mekong Smile Cruise. We were lucky enough to just have 5 of us on the cruise and we had an excellent guide, San, who spoke very good English and made sure the whole trip was very enjoyable. The driver and his wife ensured we were well fed (excellent food, the best I had in Asia) and navigated the boat to ensure we experienced the best of the river and surrounding villages/caves. I would certainly recommend taking this trip as a more luxurious way to explore the river. We booked this cruise some time in advance and were a little unsure due to it being a relatively new company to do cruises along the Mekong. I was pleasantly surprised. There ended up only being four passengers on the boat, which made for a relaxed atmosphere. Our guide met us on the Laos side of the Friendship Bridge and helped us with the Visa. Once on board we were provided with details of the cruise (plenty of water, tea/coffee, fruit, etc) including the stops we would make during the two days. During the course of the cruise we stopped at two villages (one each day) and met the local families that lived there which was both fascinating and sad (because of the conditions in which they live) – make sure you pack treats for the children, pens, paper, balls, sweets, etc. The overnight stay in Pak Beng was interesting although the accommodation could be better. Walking around the village and the local market was an eye-opener. 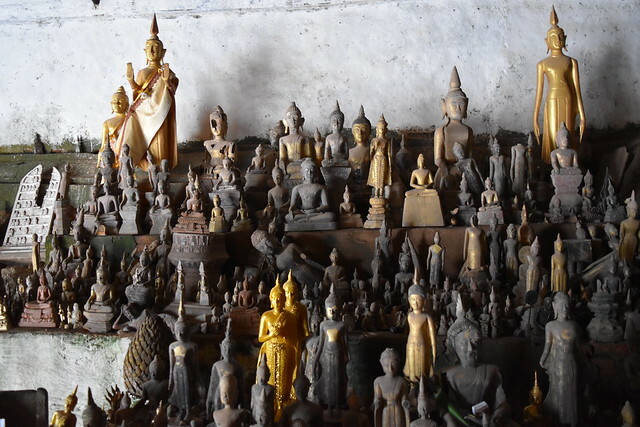 Prior to reaching Luang Prabang we visited the Pak Ou caves with its many Buddhas. Again worth the time. The meals were excellent, the tour well-constructed (with plenty of time for relaxing) and our guide Kae really added to the great experience. The 2 day cruise on the Mekong is a very unique experience thanks to 2 stops (one per day) to visit villages (minorities). It was very interesting visiting them with our guide and you don’t see any other tourists (we were only 4 on the boat, so it was very pleasant, we had many space!!). You also stop at the Batu caves before arriving at Luang Prabang, so you don’t need to come back another day! The food on board (lunches) is also very good. The guide was very helpful, every transfer was arranged (for instance when you arrive at Luang Prabang, a car is waiting for you to transfer to your hotel). This cruise is a very nice memory from our trip. It is of course more expensive than the public boat, but it is definitively worth it. Thank you very much for this! This option to cruise from Houei Xai to Luang Prabang is perfect for families and those looking for value for money. You won’t be packed in with the mobs but sit in comfort with a great guide. Stops at ethnic villages. Top-shelf accommodation in Pak Beng. Highly recommended. Good value for money! Two days of the wonderful landscapes, good services and the nice people on the boat. They provide any kind of need and you can relax and enjoy the trip. You visit also two villages and the famous Pak Ou caves. Don’t make the mistake of rushing from Houayxai to Luang Prabang. This stretch of river needs time to really appreciate. Mekong Smile Cruises is a great option. They have great helpful staff and guides. Their itinerary makes very special stops in ethnic minority villages. Excellent lunch on board and we’ll organised overnight in a good quality hotel in Pakbeng. More expensive than other options, but we’ll worth it for those that want a personalized and unique experience. We travelled with Mekong Smile cruises from Huay Xai to Luang Prabang downstream on 21st Feb for the 2 day cruise and it was fantastic. As the company is only new it’s not as well known yet and we were fortunate enough to be the only ones on the boat so we had the guide’s undivided attention. Bounthan (we named him Johnny) was very informative, but he gave us quiet time when needed. We were supposed to go with a competitor but are so very glad we didn’t, we seen those boats along the river and they were all full. Our guide, boat captain & cook were very professional and accommodating. The lunch provided was very tasty and plentiful, the cook is a very good cook, and the boat captain amazed us with the way he handled his boat. 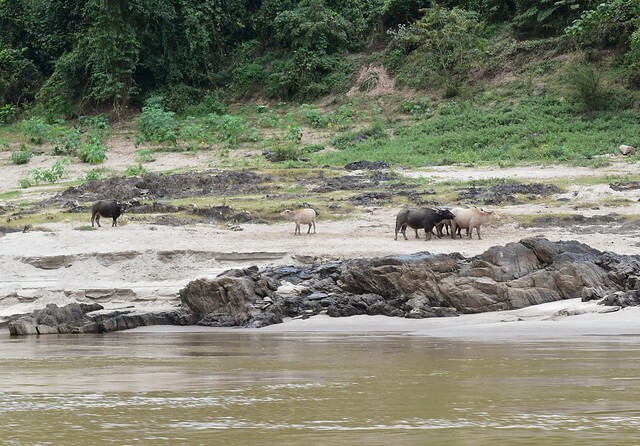 We had a reservation at the Mekong riverside lodge for the overnight stay at Pakbeng and Johnny told us the elephants come down to bathe at 6.30 in the morning, we seen them and heard them trumpeting to each other, it was the highlight of our trip through Laos. My partner loved cruising down the Mighty Mekong. We would highly recommend the Mekong smile cruise company, I want to thank the staff for a very memorable 2 days. After more than 5 months of traveling through Myanmar, Thailand and Laos we were prepared to take the normal slow boat from Huay Xai to Luang Prabang our last destination before we had to return home. Accidently we found a flyer of Mekong Smile Cruise and decided to try a more relaxed way. On March 1st, 2015, we were on the boat downstream to Luang Prabang. Although we were only two passengers Mekong Smile Cruise made this highly enjoyable trip possible. Everything was well organized, we got excellent food onboard and stayed overnight in a very good hotel in Pakbeng. The boat crew was very friendly and helpful and we had a pleasant time with our guide. Finally the timing at the Pak Ou caves was perfect, we had them for our own. We can highly recommend this cruise and the service provided by Mekong Smile Cruise. I went on the Mekong Smile Cruise with my girlfriend from Huay Xai to Luang Prabang. We had the best cruise thanks to Mekong Smile Cruises great staff. We saw many other boats, but they were very crowded and not as much space to the passengers as we had. I can recommend this to everybody!